Serengeti, Ngorongoro, Kilimanjaro, Zanzibar… The names roll off the tongue like a roster call of Africa’s most alluring destinations, all packed into one country. Resonating with hints of the wild and exotic, these four alone are reason enough to justify packing your bag and heading off to Tanzania. But the list isn’t finished. Bagamoyo, Tabora, Ujiji – stops on the 19th-century caravan routes into the heart of what was then an unknown continent. Mafia and Pangani – once famed ports of call for merchant ships from the Orient. Kilwa – linchpin of a far-flung Indian Ocean trading network. Kigoma, Kalema, Kipili, Kasanga – bustling outposts along the remote Lake Tanganyika shoreline. Selous – Africa’s largest protected area. Ruaha and Katavi – insider tips for serious safari-goers. Mahale and Gombe – prime destinations for seeing chimpanzees in the wild. Within the space of several hours, it’s possible to go from lazing on idyllic beaches to exploring moss-covered ruins of ancient Swahili city-states; from climbing mist-covered slopes in the Southern Highlands to trekking through the barren landscapes around Ol Doinyo Lengai, guided by a spear-carrying Maasai warrior. Yet, despite its attractions, Tanzania has managed for the most part to remain unassuming and low-key. It has also remained enviably untouched by the tribal rivalries and political upheavals that plague many of its neighbours, and this – combined with a booming tourism industry – makes it an ideal choice for both first-time visitors and Africa old hands. Throughout, Tanzania offers travellers an array of options, set against the backdrop of a cultural mosaic in which over 100 ethnic groups amicably rub shoulders. While most visitors head straight for the famed northern wildlife-watching circuit, followed by time relaxing on Zanzibar’s beaches, Tanzania has much more to offer anyone with the time and inclination to head off the beaten path. 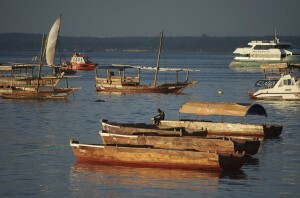 Follow the coastline south into a Swahili culture whose rhythms have remained in many ways unchanged over the centuries. Journey through rolling hill country along the Tanzam highway, detouring to Ruaha National Park. Admire ancient rock paintings around Kolo village. Explore the Lake Victoria shoreline, with its small fishing villages and tranquil islands. Experience the seldom-visited wilderness of Katavi, teeming with buffaloes and hippos. If you’re seeking creature comforts, stick to the northern safari circuit and Zanzibar, where there are sealed main roads and many hotels and restaurants. Elsewhere, and especially in the south and west, you’ll soon find yourself well off the beaten path, surrounded by a Tanzania that’s far removed from Western development. Wherever you go, take advantage of opportunities to get to know Tanzanians. With their characteristic warmth and politeness, and the dignity and beauty of their cultures, it is they who will inevitably wind up being the highlight of any visit. Chances are that you’ll want to come back for more, to which most Tanzanians will say ‘karibu tena’ (welcome again). Think of East Africa and the word ‘safari’ comes to mind – and Tanzania offers the finest safari experiences and wildlife spectacles found anywhere on the planet. You will never forget the shimmering carpets of zebras and wildebeests, the explosion of cheetahs springing from cover, or the spine-tingling roars of lions at night when you visit the Serengeti or Ngorongoro Crater. But with over 40 national parks and game reserves to choose from there is plenty of room to get off the beaten path and craft your own safari. Since its official opening in 1977, Kilimanjaro National Park has become one of Tanzania’s most visited parks. Unlike the other northern parks, this isn’t for the wildlife – although wildlife is there. Rather, it’s to gaze in awe at a mountain on the equator capped with snow, and to take advantage of the chance to climb to the top of Africa. A visit to Tanzania cannot be complete without a visit to the Spicy islands of Zanzibar â€“ a paradise where Arabia meets Africa. The Zanzibar Archipelago is about 15 miles away from Tanzania’s Mainland. These islands are perfect for holidays and honeymoons. After all, it is a tropical paradise near the earth’s center. If you are looking for fresh air and clean beaches, Zanzibar, Tanzania is the place for you. It is rich in natural resources and greens. The main products of the archipelago, Pemba Island in particular, are cloves, cinnamon and other spices. Since it is near the equator, the climate is summer for the entire year. But worry not; the tropical winds are cool and refreshing. The weather is always perfect for beach picnics and water sports. One should not worry about rain too. The wettest months are April and May, but the rain does not last long. Tanzania’s largest and most famous national park, the Serengeti is a 14, 763-sq-km wilderness that offers unparalleled safari opportunities. The annual wildebeest migration is the biggest wildlife spectacle on earth and the Serengeti’s biggest draw. Try to set aside as much time as possible to explore the park and appreciate its vastness. A vibrant array of colors and spicy scents lure visitors to the animated Central Market in Stone Town. Opened in 1904 as the Seyyidieh Market the myriad stalls run over with tropical fruits, exotic spices, brightly colored khangas (worn by local women) and rare provisions such as pomegranates and red bananas. Locals come daily from the surrounding areas to display their subsistence wares and fisherman display their catch of the day with a pungent array of fresh fish from huge marlins to salty sardines. For an evening snack head to East Africa’s best street market held every night by the waterfront at Forodhani Gardens. There are many superb white beaches, warm waters and picturesque villages around Zanzibar ideal for those wanting to get away from the bustling town life, particularly along the northern east coast. Modestly veiled women make bright splashes of color along white sandy stretches of beach, dhows with curved sails drift along close to shore and fisherman offer their fresh catches of the day to the simple seaside restaurants. Miles of pristine beaches are dotted with pockets of guesthouses, particularly around Kendwa and the fishing village of Nungwi, renowned for its tradition of boat building, and one of the most popular locations, particularly with a younger crowd. There is excellent diving and deep-sea fishing off the coast. One of the most beautiful and isolated beaches is at Matemwe. The small offshore island of Mnemba has a fine coral reef for some of the island’s best diving. Every visitor who comes to Tanzania will take away with them something special to remind them of their trips to our country, be it a ring fitted with glittering Tanzanite or a carving of giraffe or buffalo on the wind-swept plains. At the Tanzanian Tourist Board, we want to make sure you get the most out of your experience shopping in our country and take away only the best memories of your trip. What follows is advice and pointers about the most special and unique items our country has to offer, and information about where to shop, what local curious to buy, gemstone purchasing, and items to avoid, as well as useful advice about bargaining and carrying purchases home. Tanzania can be visited during all seasons. The weather is coolest and driest from late June to September, although in July and August, hotels and park lodges, especially in the north, are at their fullest. October and November are very pleasant, with fewer crowds and a slowly greening-up landscape as the short rains begin in many areas. From late December until February, temperatures are high, but not oppressive. Watch out for high-season hotel prices around the Christmas–New Year holidays, as well as during the July-August peak. During the main rainy season (March to May), you can save substantially on accommodation costs, and enjoy landscapes that are green and full of life. However, some secondary roads may be impassable, and this is the time when many hotels close for a month or so, especially along the coast. Malaria risk, especially in coastal and low-lying areas, also tends to be higher at this time. Tanzania has a generally comfortable, tropical climate year-round, although there are significant regional variations. Along the warmer and humid coast, the climate is determined in large part by the monsoon winds, which bring rains in two major periods. During the masika (long rains), from mid-March to May, it rains heavily almost every day, although seldom for the whole day, and the air can get unpleasantly sticky. The lighter mvuli (short rains) fall during November, December and sometimes into January. Inland, altitude is a major determinant of conditions. The central plateau is somewhat cooler and arid, while in the mountainous areas of the northeast and southwest, temperatures occasionally drop below 15°C at night during June and July, and it can rain at any time of year. The coolest months countrywide are from June to October and the warmest from December to March. When it comes to travel in Africa, choosing between the Cash Option and Credit Cards can be a difficult decision. The national currency in the country of Tanzania is the Tanzanian shilling (TSh). Whilst larger establishments are generally willing to accept US Dollars and British Pounds, smaller shops and street vendors tend to be reluctant to trade with anything other than shillings.